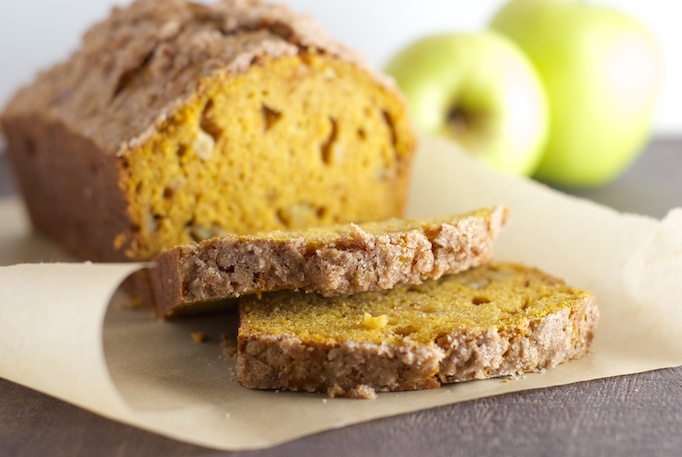 I’ve been making this pumpkin apple bread for years. It is fairly simple, and turns out perfectly every time. I even like the cinnamon sugar topping so much, I use it on other things, like my favorite easy Applesauce Cake. The bread is delicious as is, but a few nights ago I decided to dredge two small pieces into sugar, and grilled it in a pan with a pat of butter to caramelize the sugar, and then topped with ice cream. Awesome. Place oven rack in the middle of the oven. Heat to 350 degrees-F. Butter two 9 x 5-inch loaf pans (I used 8.5 x 4.5-inch pans). Sift flour, salt baking soda, and spices into a medium bowl, or onto a sheet of wax paper. In a large bowl, lightly beat the eggs. Whisk in pumpkin, oil and sugar. Add flour mixture, stirring just until well combined. Fold in the apples. Divide batter between prepared loaf pans. 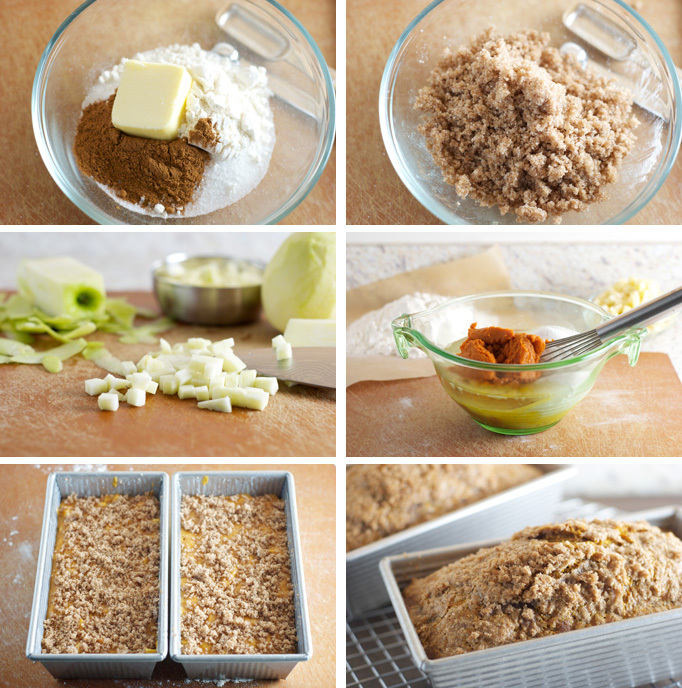 Sprinkle half of the topping evenly across each loaf. Bake until a wooden toothpick or skewer inserted in the center comes out clean, 50-60 minutes. If you use the smaller pans as I did, the baking time will be on the longer side; mine took the full 60 minutes. Cool loaves in pans on rack for 45 minutes, then turn our on rack to cool completely, about 1 hour. 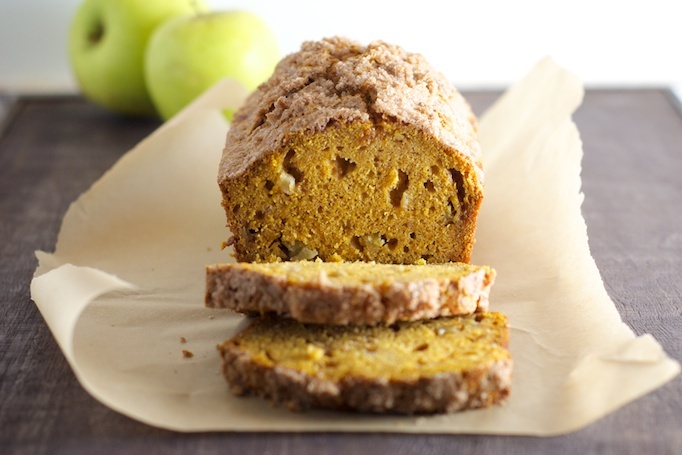 How much fresh pumpkin would you use for this recipe? Hi Nancy! There are 1 3/4 cups in one 15oz. can of solid-pack pumpkin. You should be able to substitute freshly prepared pumpkin one for one, however I would make sure the fresh pumpkin is well drained since this bread already comes out very moist. Thank you so much for your reply. As I live in the Netherlands, i am not familiar with US measurements, also pumpkin in can is nowhere to be found. Luckily, I have pumpins in my vegetable garden. II can’t wait to try your recipe! It looks so good and I love the fact that there is no butter. Thanks again Heather!